GrowTent 1.2 Grow. 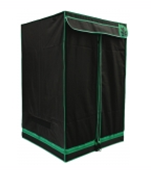 GrowTent is a self contained growing environment manufactured from 100% lightproof fabric with waterproof inner lining. The GrowTent 1.2 GROW design incorporates ventilation holes for your intake and exhaust fans as well as outlets for your cabling needs. There are also integrated openings for irrigation tubes and 2 ducting socks for use with inline air-cooled lighting systems such as the PowerPlant AeroWing. 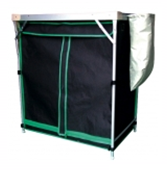 There are 5 ventilation flaps situated around the base of the GrowTent to assist with good airflow. The GrowTent is also equipped with 3 handy pockets for storing all your accessories. 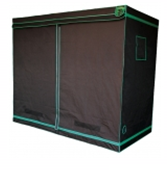 – Easy side access via zip off panels with light proof over-flap – 10″ drawstring ventilation apertures give the ultimate in flexibility – All GrowTents feature 360 degree venting for uniform distribution of airflow – Spidermite-proof netting on all base vents to stop those mites.